motifs. The impression of life and coherence prevails in the way his sculpture is received. A vital component of Panaite’s creation represents the importance given to the correlation between his sculpture and the environment, a fact visible both in the ensembles of works created and also in the urban projects conceived in the last few years. 1992 - Faculty of Decorative Arts and Design, specializing in sculpture, "George Enescu" Academy of Arts, under the guidance of the following professors Vasile Condurache and Ion Antonica, Iasi, Romania. 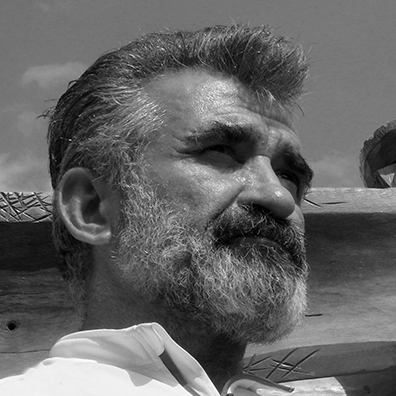 1992 - 2002 - Professor at the "Dimitrie Cuclin" School of Art, specialized in Sculpture and Fine Art, Galati, Romania. 2013 - 2014 - Architectural project with fountains for the urban planning of Green Square Braila Boulevard, Galati, Romania. 2000 - Between Heaven and Earth, "Nicolae Mantu" Art Gallery, Galati, Romania. 1995, 1996, 1998 - Group exhibition held by the Romanian Fine Arts Union, Galati Branch, Romania. 2006 - Creative Camp Art like life, participating with the work Toaca (wood and metal), Galati Visual Arts Museum, Romania. - Toaca (a complex structural ensemble, consisting of a central ronde-bosse, of about 2 m, surrounded by 12 other ronnde-bosse's, in a hourglass shape. On the central shaft, the artist raised up human faces with hieratic expressions - 12 hourglass carved in walnut, treated in a complicated way after carving - electroplating). 1992 – The Nation’s Column, a monument dedicated to the heroes of the 1989 Revolution, Dorohoi, Romania. Stoica, Corneliu, The Dictionary of Fine Arts Artists of Galati , second edition, revised and whole, Axis Libri Publishing, Galaţi, 2013, p. 65-66. Ciuca, Valentin, Illustrated Dictionary of Fine Arts in Moldova 1800 - 2010, Art XXI Publishing, Iasi, 2011. Ciuca, Valentin, A Century of Fine Arts in Moldova, Art XXI Publishing, Iasi, 2009.